IPAM presented a brief (link below in French) to the public hearings of the Committee on Planning and the Public Domain on Bill 122 – An Act mainly to recognize that municipalities are local governments and to increase their autonomy and powers. Key points : sustainable development; the abolition of referendums; strengthen participative governance; requalification zones and policies on information and consultation; and how to improve referenda procedures. Montréal-Métropole: Please share your ideas! Thank you to everyone who attended our public forum held on November 30 at the Canadian Center for Architecture, as well as our January 30 roundtable at Rayside-Labossière. These two major events underscored the need for public debates as such, considering the potential impact of Bills 121 and 122. In addition, the strong social engagement in these discussions demonstrates the importance of these topics to the public and, consequently, the attention and consideration that provincial and municipal governments should give to it. We ask you to share some of your ideas and/or concerns, since IPAM is committed to compiling a brief that could eventually be presented to the parliamentary committees on urban planning of the City of Montreal. http://ipamontreal.org/wp-content/uploads/2018/01/logo-good.png 0 0 IPAM http://ipamontreal.org/wp-content/uploads/2018/01/logo-good.png IPAM2017-01-31 11:55:372018-03-13 11:58:20Montréal-Métropole: Please share your ideas! 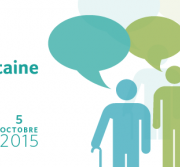 The next Metropolitan Agora (link only in French) will be held Monday, 5th October 2015 with the theme: ‘Building Together the Future of Greater Montreal’. The establishment of a Metropolitan Agora is one of the monitoring measures included in the Metropolitan Plan of Urban Planning and Development (PMAD). The participation, through the Metropolitan Agora, of civil society in the follow-up to PMAD is a new element as compared to usual practices in urban planning. 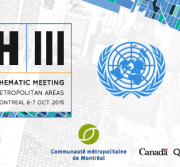 The Montréal Thematic Meeting on Metropolitan Areas will be held in preparation for the Third United Nations Conference on Housing and Sustainable Urban Development (Habitat III) to be held in Quito in 2016. On October 6 and 7, 2015, more than 500 stakeholders of the international community will gather in Montréal to discuss ‘The New Urban Agenda for the 21st Century’ and to adopt the Montréal Declaration on Metropolitan Areas. You are invited to attend the first meeting of ‘The Right to the City – Montreal’. Panel Discussion: Housing Justice and the Right to the City: Hamburg, Barcelona and Montreal. With the spectres of real estate speculation and corporate driven profits dominating our cities, gentrification and higher rents are displacing poor, migrant and homeless people. What can we do about this? In Hamburg and Barcelona, residents are organizing and, through protests and squatting, successfully fighting for their right to housing. The panel brings two speakers from these cities to share their experiences, preceded by a screening of an interesting documentary, ‘Si Se Puede: Seven Days in PAH Barcelona’. The screening and the panel will be in English with whispered French translation. Alternatives: 3720 Ave du Parc, 2nd Floor. Cnr of Pine Ave.
FLORIAN KASISKE is an activist from the Right to the City Network Hamburg, a network uniting more than 60 initiatives including social centers, neighborhood initiatives against displacement and ecologist groups. SANTI MAS DE XAXAS FAUS is a Barcelona activist with the PAH (‘Platform for those affected by Mortgages’), a citizen’s movement considered the most successful housing justice organization in Europe. At the invitation of the Institute for Policy Alternatives of Montreal (IPAM), some thirty Montreal stakeholders met on February 3, 2015 to discuss tax issues, municipal and alternative modes of financing for Quebec municipalities in general, and for the city in particular. In the form of open discussion, the exchanges allowed participants from different backgrounds to compare their perception of the problem and their ideas. The discussion focused on the advantages and disadvantages of property taxes and alternative financing, the special case of Montreal and the means to achieve the city you want in the long term. In the coming months, the status of Montreal will be reviewed by the Quebec government to give it more powers and diversify its sources of revenue. The report will lead to the production of an IPAM thesis on the subject to guide the organization in its participation in future discussions.